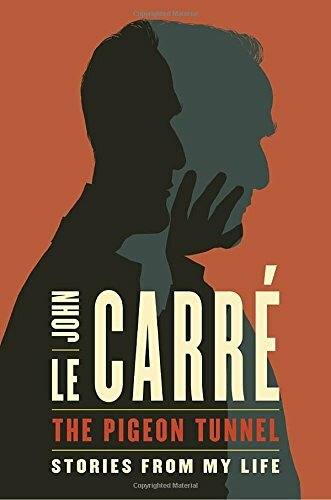 The Pigeon Tunnel by John le Carré is a collection of autobiographical stories that reveal the iconic espionage thriller author to be a complex man as full of restless twists as his novels. His true name is David Cornwell, a fact everyone but I knew, and he really did work for British Intelligence (MI5 and MI6) for nearly a dozen years. The stories in The Pigeon Tunnel are neither chronological nor do they form a single narrative. They are knit together by the impact of Cornwell’s family dramas, his quests to find literary inspiration in the world’s hot spots, and his richly layered prose. As a youth, Cornwell was dispatched to collect Ronnie’s race winnings or money owed by other punters. One mission took 16-year-old David from his British boarding school to Paris to knock on the door of the Panamanian ambassador to France. After a surreal evening, the ambassador says not only is his debt to Ronnie bogus (something to do with selling repackaged whiskey in Panama) but Ronnie owes him money and would young David please pay up. Years later, while researching THE TAILOR OF PANAMA, Cornwell finds out the so-called ambassador was a con man in his own right and never a member of France’s Foreign Service. Cornwell’s mother abandoned Ronnie and their two sons when Cornwell was five and his older brother was seven. Cornwell tracked her down when he was 21, to find she’d remarried and her new family was blissfully ignorant of her past. His imagined account of her last few days as Mrs. Ronnie Cornwell is dispassionate yet telling. They stayed in touch and he still has the suitcase she used when she ran away. Thus the theme of The Pigeon Tunnel is revealed. Tension. The freedom we crave to make our own choices versus the constraints of breeding/clan/geography/education/expectations. The tension that comes with manipulation by those with roughshod agendas and the throb that comes with being the manipulator. Readers will recognize this as the essential theme of every le Carré book. The Pigeon Tunnel is the backstory to those novels. For 50 years, Cornwell has explored conflict zones and written about their inhabitants. Rwanda, Congo, Cambodia, Vietnam, Palestine. Mobster’s lairs in Moscow and the former Soviet republics as power vacuums are filled. Central American jungles and border crossings where authority is a sketchy notion. Many times the book zeros in on a specific moment or interaction that later informs a character. One riveting story is his interview of a German terrorist held in an Israeli jail as he researched The Little Drummer Girl. The female warden speaks to both Cornwell and prisoner in English. Cornwell and the prisoner speak in German. When the prisoner is taken out of the room, Cornwell realizes he has continued speaking German to the warden. She won’t address the prisoner in German because of her experiences in the Dachau concentration camp. Most of Cornwell’s intel career happened in Germany and Austria in the 1950’s. That was the epicenter of the Cold War spy game, captured so well in his early writing career. The Spy Who Came in from the Cold was his first big financial and literary success and he refers to it more than any other. It became a movie starring Richard Burton, for which Cornwell was screenwriter and Burton’s babysitter during the stormy filming in Dublin. I hoped for insights into the George Smiley novels and movies (A Murder of Quality, Tinker Tailor Soldier Spy, Smiley’s People, etc) In addition to a few Alex Guinness memories, I got my wish with Cornwell’s assessment of the handling of the Kim Philby affair. Cornwell knew many of the players and has an insider’s view to offer, including his conversations with the best friend that Philby betrayed. Although the memoir is peppered with intelligence career anecdotes, Cornwell never mentions who was the inspiration for Karla, George Smiley’s Russian spy nemesis, or if Cornwell ever exchanged cigarette lighters with him. If you don’t know what I’m talking about, read Smiley’s People. Now. As soon as you finish reading this. I closed The Pigeon Tunnel wanting more. More behind-the-scenes confessions. More striking prose from this master of evocative description. But Cornwell knows when and how to end a tale and leaves us with an anecdote loaded with both humor and irony. Oh, and the title? No spoilers here but it speaks to the tension with which Cornwell still lives and writes. About the reviewer: In addition to romantic thrillers The Hidden Light of Mexico City and Awakening Macbeth, Carmen Amato is the author of the Detective Emilia Cruz mystery novels set in Acapulco and recently optioned for television. Originally from New York, her travels around the world inspire many of her books. Visit her website at carmenamato.net and follow her on Twitter @CarmenConnects.